What Things Help To Have Healthy Hairs? Home Hair Loss What Things Help To Have Healthy Hairs? Today we spend more on various types of artificial beauty treatments for making personality to groom all 365 days of life. But if you see in whole ancient period there were no such kind of treatments introduced to humanity but still that people in appearance were much more good-looking and yet healthier. Even today we do appreciate for such ecstasy dignifying beauty. Scalp hairs use to get special attention and had significance in their life. These past people use to make sure that they give almost natural treatment to hairs that what makes them to stay healthy and silky. Just by following their strategies, even you can have healthy, silky and bouncy hairs too. Go through this short article and discover things that help to have such lustrous hairs. Do not allow at any cost hairs to be tangled and produced intangible knots within it. No matters even you have dry, frizzy or curvy texture of hairs. More often brushing hairs allows sorting knots if any and releasing every hair freely. Brushing also generates the pressure points to active and circulates blood flow. Also ensure that your brush you gently very gently otherwise it will pull off some of your hair, plus will also weaken the root scalp to grow up the hair. It would be better if you use a thick comb instead of a brush or thin comb. Does comb your hair in flow the way they grow and not in the opposite manner as may pain your scalp too. Once in a while do massage your hair. Massage actives the pressure point to circuit healthy blood circulation and exfoliate dead cells that blocks the roots of hair to grow. Do not vigorously massage the scalp. Especially before hair wash takes some good hair oil, take enough amount palms and try gently to massage on scalp. For effectiveness, you can lukewarm oil and cover it with hot steamed towel. After the massage and is covered with towel, leave it for minimum 1 hour and then go for hair wash. Massage with lukewarm oil is the best treatment for scalp hair with dandruff, dry, frizzy or tangled. After a hair wash it will leave smooth and shiny hairs. If you have long hairs then there is a special need of haircut otherwise, it will support to grow split ends in hairs. If your hairs grow slowly, you can cut them after every 3rd month otherwise you can cut on every end of the month. Do make the haircuts from good salon only for perfect and proper shape and lengthen. You should always intake meal that consists of vitamins, iron and proteins. Fish food is a good food. The fish oil helps to grow scalp hair rapidly and gives them a natural shine even better than any fancy conditioner. Other than fish food, you also have green leafy vegetables and white shell of boiled egg. 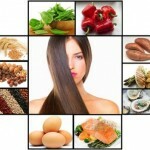 This entire ingredient in meal gives you vitamins B, C and E helping hairs to grow healthy.